While it’s easy to think that straightening the teeth will only provide a cosmetic improvement, the truth is that a perfectly aligned smile is usually a healthier one as well. At New Haven Dental Group, we can provide personalized orthodontic solutions for patients of all ages, able to fix crooked teeth and misaligned bites with relative ease. To learn more about your orthodontic options with us, call today to schedule a consultation. 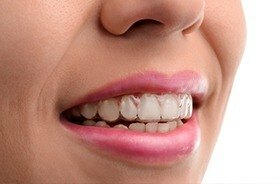 Traditional metal braces are still the most reliable, durable, and affordable solution for misaligned teeth and bites available today. A specially bent wire places a consistent pressure on the teeth that slowly shifts them into their ideal positions, and it’s held in place using a series of brackets on each teeth. Thankfully, the braces of today are very different than the ones you might have seen as a child—they are smaller and more subtle, helping them stick out less in the smile. 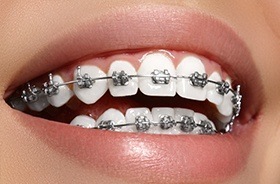 For more image-conscious adults and children, clear/ceramic braces offer the best of both worlds. They work using the same trusted method as metal braces, but they have a discreet appearance similar to an aligner treatment like Invisalign. Clear brackets hold tooth-colored wires in place that seamlessly blend into the teeth, allowing a patient to smile with complete confidence throughout treatment. If you’re interested in straightening your teeth, but you can’t imagine facing the world with a mouthful of brackets and wires, then Invisalign was designed just for you. A patient simply has to wear a series of thin, clear plastic aligners that slip easily over the teeth. Each one brings the smile closer to its ideal position, and whenever you need to eat or brush, you can simply take Invisalign off until you’re done.